Mints are perennial herbs that grow so rapidly that they can become invasive weeds if they’re not controlled by containment. Undemanding and very forgiving, mint is the perfect plant for the beginning gardener. Even if you’re the greenest novice with the brownest thumb on the planet, you can successfully grow mint from cuttings. The bonus is that you’ll soon be harvesting a cup or two of tasty, aromatic mint leaves each week. Poke six to eight holes in the bottom of a container. Fill it to within 1/2 inch of the top with compost or rich potting soil. Set it in a shallow pan of warm water until the surface of the soil feels moist to your touch. Remove the container from the water and allow it to drain freely for about two hours. 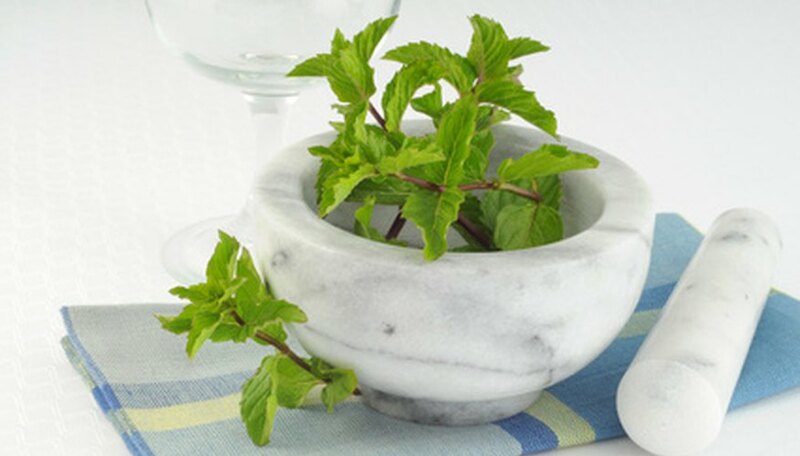 Choose a healthy, attractive mint plant to take your cutting from anytime during the spring or summer growing season. This cutting will be a clone of the parent plant, so pick one that you like. Cut several 4- to 6-inch unblemished stems from the parent plant. Make each cut just below a leaf note. Cut off all of the foliage except for the highest pair of true leaves. Push the cut stem about 1/2 to 1 inch deep into the moist soil. If you’re starting multiple mint cuttings, position them so that their leaves aren’t touching each other. Seal the potted cutting in a clear plastic bag and poke about six holes in it. This will retain moisture and humidity. Set the cutting in a warm, brightly lit spot out of direct sun. The top of your refrigerator or above a hot water heater are good choices. Your mint cutting will root in two to three weeks. Check on the cutting every day to make sure that the soil doesn’t dry out. It should remain evenly moist but not soggy or wet at all times. Gently tug on the cutting after two or three weeks. If it resists, it is rooting. Remove the plastic bag and move your new mint plant to a bright window out of direct sun. Keep the soil evenly moist. Move it to a sunny window a week later. Plant the thriving mint in a sunny or partially shaded spot outdoors a week after that. Be nice to your neighbors and to the environment. Contain your outdoor mint plants so that they don't rage out of hand and encroach onto the properties of others.